The idea of leather nails may sound two ways to a typical, relatively in-the-know beauty consumer: gaudiness at its most fashionable, or awesome-ness at its most fashionable. Nails Inc. have had leather nails for some time now as Alexa Chung wore their original Leather Effect kit, complete with skull and bones decals, to the British Fashion Awards in December 2012. 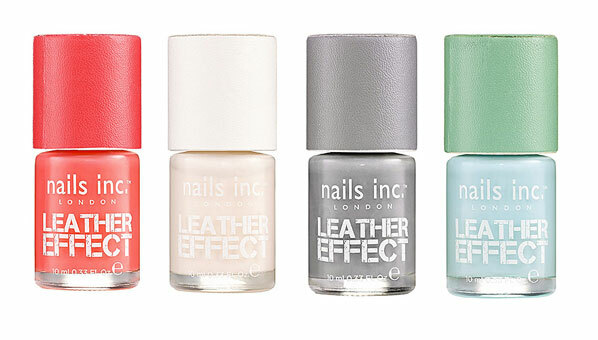 The only-polish version that’s also now available in the U.S. in five shades (more choices in the U.K.), is meant to mimic the look of leather as opposed to actual leather applied to your nails. The colors are great in the bottle. Pastel yet potently colored, and the coral is unexpected. Leather in other colors, even in real life, is always exciting and different. The actual delivery though of the effect is lackluster. It’s the kind of special effect that you have to see up close than preferably just a few persons away. Hues wise, the effect looks best in, naturally, the black shade, where the matte finishing helps to make the slightly bumpy texture noticeable. In the other colors, you can barely tell. The attempt at bringing a much desired nail art detail accessibly is cause for kudos, but it does fall flat, especially when Chung’s version really did appear as an leather applique. At an affordable $11, this look may be best for longer nails, where on shorter nails, it won’t be as eye-catching.